On the basis of a recently published report by Transparency Market Research, titled, 'Tangerine Essential Oil Market: Global Industry Analysis and Opportunity Assessment 2018-2027', the overall revenue generated from the tangerine essential oil market is anticipated to be valued at somewhere around US$ 188.2 Mn in 2018, which is expected to rise at a CAGR of 3.9% throughout the forecast period (2018-2027). Over the last few decades, there has been subtle growth in the demand for tangerine essential oil in the global essential oil market, owing to the increase in the application of tangerine essential oil in food and beverage products. The escalating demand for vibrant flavors in convenient food products is also fueling the demand for tangerine essential oil. The surge in demand for natural ingredients in cosmetics and personal care products is contributing to the increasing demand for tangerine essential oil among manufacturers. In addition, the application of tangerine essential oil in aromatherapy is one of the upcoming fields, where essential oil is gaining strong demand from the health-conscious population. The increasing demand for tangerine essential oil as a natural ingredient in the cosmetics and beverage industries is also increasing the demand for tangerine essential oil in the global essential oil market. In the global tangerine essential oil market, Europe holds a prominent share, i.e. 35% value share of the consumption of tangerine essential oil. North America and Europe have a major share in the production of tangerine and tangerine essential oil in the world. On the basis of our analysis, the market in Asia Pacific is expected to grow at a high rate, owing to factors such as rapid establishment of industries and increasing footprint of global players in the region. Many industrialists and food manufacturers are showing their keen interest in using tangerine essential oil in their products and recipes. With the increasing demand for tangerine essential oil in various sectors, it is expected that the overall demand for tangerine essential oil will increase over the forecast period. Customers are always seeking novel treatment options to reduce the signs of aging. The expectation of customers from treatment usually tends to be multipurpose, necessitating the demand for treatments to address multiple concerns. Aesthetic practitioners across the globe are adopting novel methods of improving skin quality and preventing skin damage. Tangerine essential oil has various health benefits, such as it is found to be helpful for skin health, immune health, and stress-related diseases. Tangerine essential oil is excellent in the treatment of depression, debility, and insomnia. In addition, tangerine essential oil also helps in boosting metabolism, which has a direct connection between the most common obesity problems. Owing to many health benefits, perfume and cosmetic manufacturers are using tangerine essential oil in their products to cater to the demand from the growing health consciousness population. TMR has profiled some of the prominent companies active in the tangerine essential oil market, such as NOW Health Group, Inc., doTERRA International, LLC, Lionel Hitchen Essential Oils Ltd., Lebermuth, Inc., Eden Botanicals, Vigon International, Frutarom, Symrise AG, Berje Inc., Citrus and Allied Essences Ltd, Firmenich SA, Young Living Essential Oils LC, Mountain Rose Herbs, Inc., The Essential Oil Company, Ultra International B.V, and others. The report explores the global tangerine essential oil market regarding the current market drivers, trends, and opportunities that are expected to affect the market during the period 2018–2027. 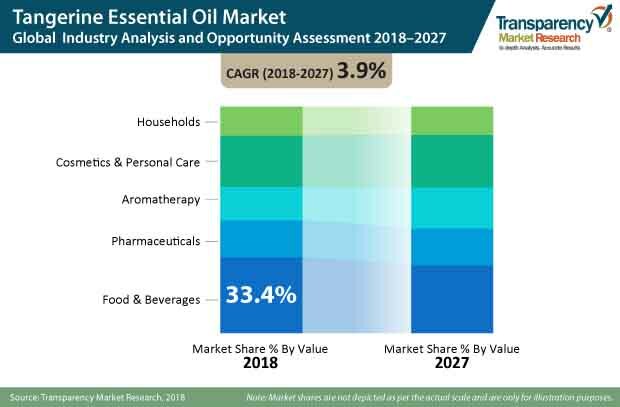 Yet another key feature of this report is the competitive landscape of many key players involved in the tangerine essential oil market in a comprehensive and comparative dashboard. In addition, key developments and strategies are also enlisted, which can give an idea for growth and development.